Warm weather has arrived, school is out and tennis season is in full swing. As I mentioned earlier in the week, getting dinner ready for the family before match time can be challenging! Fortunately, though, in our Boise league, we get treated to a wealth of delicious snacks after team play is complete. 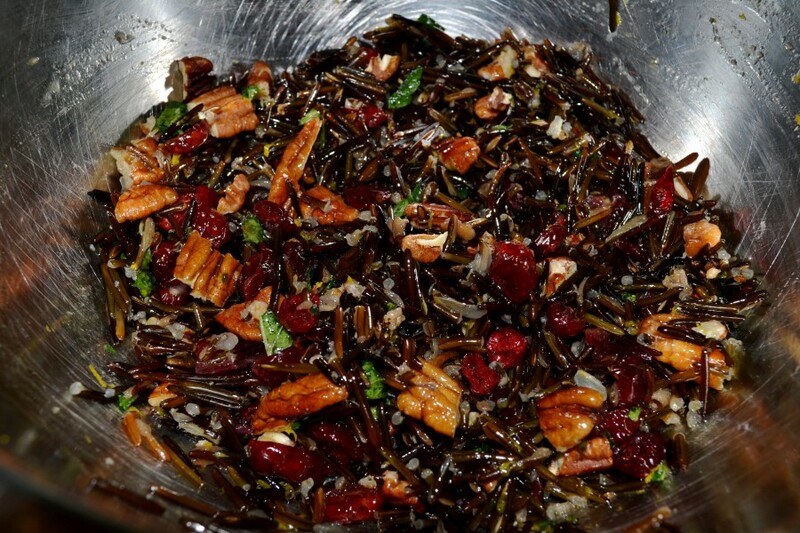 A few weeks ago, after playing team Honey Badgers, friend/colleague Nancy Gordon whipped up another delicious treat for the ladies – a nutty wild rice salad. A Silver Palate original, Nancy added some of her own twists, as did I, which are shared below. Grain salads are ideal to make in bulk at the start of the week. You can serve them alongside a piece of grilled chicken or fish for dinner, or eat as a standalone dish for lunch. Grains, in general, are great sources of protein and fiber, and wild rice is no exception to the rule. For more ideas on grain salads like these, Bon Appetit has a wonderful spread in this month’s issue. Rinse rice under a strainer with cold water. Place rice in saucepan along with broth. Bring to a boil then turn down eat and simmer uncovered for about 45 minutes. Check the rice after 30 minutes for doneness. You actually want the rice to be firm in texture when fully cooked. It’s not nearly as flavorful if it becomes soft. To drain, place a towel or paper towel into a colander. Transfer rice to a bowl. Add remaining ingredients and toss. Adjust seasonings to taste. Nancy suggests saving about half the toasted pecans for serving to ensure they don’t get mushy. She added Penzey’s dried mint instead of fresh mint. (I added fresh basil to mine). It’s very important for the mixture to stand for at least 2 hours for rice to “drink” the juices/seasonings and the flavor to develop. Many thanks to Nancy for sharing the recipe as well as her delightful secrets!